I entered the control room of the studio, waiting for the After Record to begin. Fewer than ten minutes to 10am, and the voice actors were already gathered in the recording studio. Of course, Nitadori arrived far earlier than I did, and was repeatedly greeting the seniors. Once I saw her, the handsome voice actor portraying Shin entered. Once Nitadori spotted him, she stood before him bowing respectfully. I felt that she bowed more deeply towards him as compared to everyone else, or perhaps it was just me imagining things. So I thought about various things, and what happened yesterday. I recalled how that detective had just excitedly revealed my circumstances. I was sitting on the bed of the hotel room, thinking. People did say ‘when you have a tummyache, vomit, and you will feel fine’. Personally, I had a few vomiting experiences, so I understood that logic. Also, the motion to ‘vomit’ is because there is something bad inside the body (the stomach), an action to lighten the body by removing them. Surely the matter I couldn’t tell others of was the same. By saying it out, I felt a lot better. In other words, I was basically the barber in ‘The King Has Donkey Ears’. I wanted to sound out to others, but I couldn’t. It was a painful experience. So that’s how it was, so I feel really refreshed. It was the first time I could mention anything I couldn’t say over the past ten years and so, so it felt really good. But when the famed detective hit the mark, I felt it didn’t matter. At this point, trying to hide this matter would seem unnatural, so it was really strange. Of course, I didn’t think it was fine to tell anyone. I only said so only because it was Nitadori. I felt that Nitadori would keep this secret. Or rather, I felt lucky that it was Nitadori who was willing to hear me out. How did Nitadori figure it out? Was I being too callous in saying enough to hint at the truth? I didn’t remember that. Or was it that anyone reading the entire ‘Vice Versa’ series can figure it out? Is it that by reading into the work repeatedly, one can understand the subconsciousness of the author? Like what Endou-sensei said? In that case, this would probably be my diagnosis. “This author has no girlfriend, no friends, and can only write his delusion disgusting self-insert wishes, a deplorable person so pitiful that nobody can look at him in the eyes. Having my own misunderstood delusions is awesome! Stories are basically feeding an author’s delusions to the readers! In that case, it all makes sense. While thinking as I sat on the bed, the phone in the room rang. I was truly taken aback. For the first time, I knew how noisy the room’s phone was. In any case, I could only pick up the receiver to stop it from ringing. I got up from the bed, and reached out to the phone next to the mini TV. I picked it up, and brought it to my ear. I couldn’t refuse this. I opened the door, and invited her in. She entered the toilet, and whispered something to Nitadori inside. I was by the bedside, and did not know what they were talking about. Soon after, Miss Kamishiro went alone before me, to retrieve the wig and others. But even so, this call was way too coincidental. How did she know? I didn’t think she could hear us talking from outside the door. Miss Kamishiro turned to the right, and showed me her left ear, with a cabled wire attached to it. It seemed she had guessed what I was thinking. Speaking of which, I did discover a small round object stuck on Nitadori’s back when I patted her. Thinking back, my final conclusion was basically ‘ahh, I guess it’s some trendy lingerie design or something’, and didn’t pay any mind. To be honest, I wasn’t in the mood to notice that. In other words, it was a microphone, or a bug. This miniature device allows for voice reception and transmission through electric signals. That one day, I will be able to see all the ‘secret weapons’ Miss Kamishiro has. So Miss Kamishiro brought a silent Nitadori out of my room. I did not know what to say to Nitadori as I watched her leave, her back facing me. She never turned back, and vanished from my eyes. When the time slowly struck close to 10am, the start of the After Record, I was overwhelmed with terror. It’s relieving to share a secret, but this selfish thought was one-sided on my part. I never considered Nitadori’s feelings when she heard those words. Back then, should I not have lied as such, even if I had to force myself? The reason why she was so terrified that she puked was because I was too honest in my answer. Before then, I did press her hands down onto the sides of my neck; that might be a reason too. Thinking back, I shouldn’t have done so. No, I really shouldn’t have done so. If only I hadn’t done so. It was then did I realize I made a preposterous mistake. That selfish act made me uncomfortable. I was shivering, my spine tingling. The editor-in-charge, seated next to me, asked me worriedly. I was grateful for his concern, but it wasn’t the case. It would have great if it was a cold. How much discomfort did I cause Nitadori the previous night? What startling thing did I do? This time I was the one having a tummyache, and I had the urge to vomit. The After Record began, and I was fighting on. Not against sleepiness, for I had a good sleep. But against myself, who was unable to stop thinking. I thought of Nitadori and Stella the previous day, imagining what they would say to me in the future, and was starting to feel afraid. As long as I had a thought, I would shake my head, literally trying to shake it off my mind. I really hated my ability of conjuring delusions. The editor-in-charge asked me three times during the A part. And so, the first half of the After Record, the most arduous moment finally ended, and it was break time. After waiting a while, I went to the toilet. I always did so. If I did head out immediately, I would be going to the toilet side by side with the veteran voice actors who were active before I was born. Of course, I felt that I was cordial with everyone, but I couldn’t be that honest. I really would not know what I should say, and I would act suspiciously. Even if it wasn’t the case, it would be awkward conversing in the toilet. Even if it wasn’t the case, I really wasn’t in the mood today. Each break’s fifteen minute long. I waited for eight minutes, and left the booth. And once I was done, there was a drinks vending machine on the corridor. While there was a pot of coffee prepared in the audio visual room to enjoy, I will get sick drinking too much coffee, and it seemed it would agitate my stomach, more so on this day. He would greet me all the time, but his usual speaking voice was really similar to Shin, and it really intrigued me. I wasn’t in a good mood, but I could not simply ignore him. I turned my body around, and nodded respectively. I lied. The air-conditioning in the studio was really strong, and to be honest, it was cold. I really didn’t know how to retort. I couldn’t lie anymore, and tried to brush the matter aside, but the one person causing this bother to me passed by behind me. Of course, i did not intend to talk to Nitadori in the recording studio. 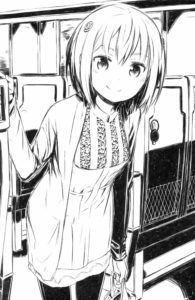 Nitadori had to stop in her tracks, and she turned around, her face stiffened as she looked at us. Did those words affect Nitadori’s job? It’ll be great if it didn’t. Various thoughts appeared in my mind, and my stomach started to ache again.. I was thinking that her reaction was normal. And also, I was wondering, did the voice actor call in Nitadori to say a few words because he knew everything? Once I had this thought, ‘no way, no way’, I immediately denied this in my mind. This isn’t much of an answer. I guess it’s a rare experience for an author to be prompted by the voice of his protagonist being animated. I wasn’t really being interrogated, but I spoke up, and I couldn’t stop. I didn’t intend to say it out. I didn’t intend to reveal these matters. I was so scared of looking, I did not know what face Nitadori was showing. I lowered my gaze, staring at the tummy of the person before me. I too lifted my head. I couldn’t see Nitadori on the corridor. Ah, I’m hated now, surely, so I thought. Though I thought so, maybe I was just thinking too much. I might have been thinking too much into it, and made a hasty conclusion based on my delusions. I could not simply admit to this. I could not allow myself to bring my delusions into reality. If I admitted to it, I would think they were real. Strangely, once the recording of the B part started, my stomach stopped aching. Was it because I said it out? Was there stomach medicine in the PET bottle? Did my worries vanished at once? Or was it all of the above? First off, the rehearsals went well, and it was Nitadori’s moment. In this show, Madoko would have the scene with the longest lines. Watching Nitadori left me unbearable, and hearing her voice left me unbearable, but I had nowhere to run. In the control room, I watched the finished footage as I heard the voice. The middle of part B.
Shin really couldn’t say that Sin had caused a huge mess to his life, and lied to Yui. Shin was really bad at lying, so Yui, who saw through the lies, questioned Shin. However, Shin, unable to say the truth, diverted the topic amazingly. Yui left the classroom in a huff, and Shin stood there. The one to console and encourage him was Madoko, who did not have a name. 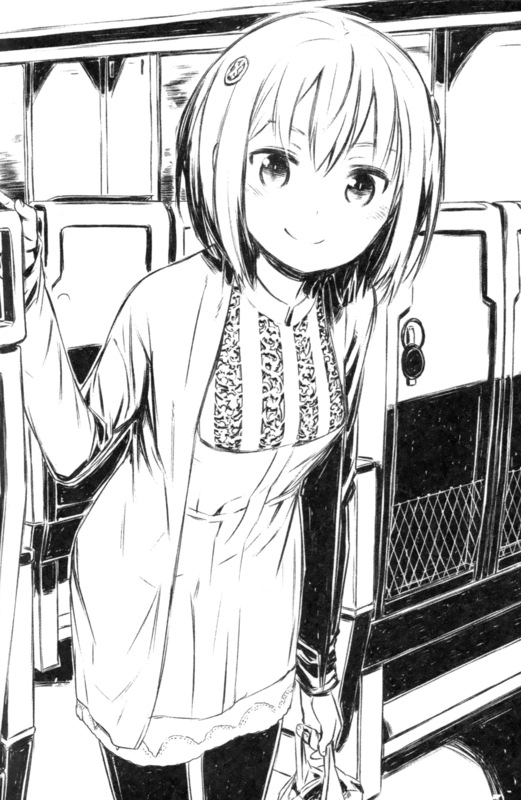 The voice actress portraying Yui finished the recording, silently left the microphone, and retreated to the back. There was a pause amounting to a few seconds, as the footage showed Sin, hiding at the Tsumizonos’ and eating miso pancakes, not knowing he was the cause of it all. During this time, Nitadori, who had been seated the entire time, got up from the chair, and stood side by side with the voice actor before the microphone. Airing on this day was the completed footage. The footage showed a closeup of Madoko, who returned to the classroom, raging at Shin as she pointed at him. There was a weak response. Shin, who was supposed to say ‘is that so?’ instead, was cut off. Madoko affirmed. At this moment, she showed a cheerful face. Shin smiled as he left the classroom, and Madoko silently watched him, the screen now showing her back. As it was a change of scenes again, the rehearsal ended. Nitadori’s acting was perfectly fine, and the sound supervisor did not give any instructions. I kept thinking about my own issues. Perhaps it’s better for us not to take the same ride the following week. If I sat at my old seat, and Nitadori didn’t show up, what do I do? If she did show up, and was unwilling to say anything, what should I do? Just imagining that left my gut winced. Am I out of the medicine in the PET bottle? So I thought, and had another two gulps of water, but the situation didn’t improve. Maybe I should take absence the following week. I couldn’t get a full attendance award, and it’s fine for an author not to be around. Most importantly, I wouldn’t have to take the train. And I heaved a small sigh of relief. Despite how vexed the author felt, the After Record continued smoothly. The rehearsal ended smoothly, and there was not much time left, so the recording for part B was officially beginning. Shin and Yui had a quarrel, and Yui left the classroom. Nitadori again stood before the microphone, portraying Madoko. 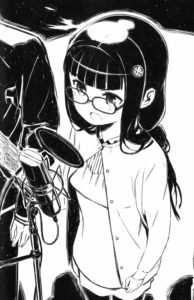 This might be the last time I would see Nitadori acting in the recording studio. So I thought as I looked beyond the glass panel. The voice actor continued his outstanding performance, ending this sequence. I could hear the sound supervisor’s voice. That voice could reach the booth, through the microphone. The sound supervisor held the switch down, and said nothing. He then called me, and I, looking beyond the glass towards the light green glasses, turned back. The scriptwriter of this episode was in this control room.The series screenwriter, along with the overall director, were both present. But even so, he went to me first. The sound supervisor widened his eyes. And then, he turned his face towards the director seated next to me. He then switched on the microphone linking to the recording booth, moving it up, and pulled the chair back slightly. I got up from my chair, took a few steps, and brought my face towards the microphone. And then, through the glass panel, I saw Nitadori’s face. Her eyes were looking right into my gaze. With a voice loud enough for everyone to hear. While everyone might be taken aback. These words probably reach this smiling her. The season of plum rain was at work, and the train moved on as it poured. I was seated at my old seat, and from the backpack on my right, I took out my smartphone, I activated it, and took a photo of the rain-stained window. I never took a photo within the train before, but I had a feeling that it would be the last time I would take this train on Thursday, at this time, and suddenly felt reluctant. I heard a voice from above. “It’s the last time…so, the window. I answered as I reached my right hand out to lift the bag, and empty the chair. Then, I saw the face of the person talking to me. I blurted out in surprise. I had assumed it would be Nitadori–but it was Stella. Stella swayed her light fluffy short hair as she quickly sat down. No, looking closely, I could see that though she wasn’t wearing glasses, she was wearing her colored contact. In this situation, how should I address her? Nitalla? Stedori? She was the usual bespectacled Nitadori. She’s not using formal language, so it’s Nitadori mode, but her appearance resembled Stella. It’s complicated. And I was really surprised by what she said. These were the causes of her negative memories, but she wanted to use them as ‘selling points’. How much resolve did she put in? How much stronger had she become? Who would that be? I thought, and I got it. To Mr Voice Actor, thank you very much, really. I really am glad that he was portraying as Nitadori. Like usual, Miss Kamishiro was dressed in her posh suit, seated at the opposite side. Nitadori received the bag, and handed it over to me. I saw that there were three PET bottles of tea inside, along with some sea salt potato chips. I really hoped there wasn’t any transmitter inside. And so I accepted, but not without asking in a half-joking, half-tentative manner. The short light brown hair matched the brown eyes. I had never seen Nitadori like this before. There were many options, but the best option was ‘others’. And I popped the first piece into my mouth.